GE Intelligent Platforms introduces the new PMCCG1 rugged PMC graphics mezzanine card designed specifically for retrofit to legacy applications that take advantage of the PMC form factor. Announced at the FACE (Future Airborne Capability Environment) Exposition at the Patuxent River Naval Air Museum in Lexington Park, MD, the new PMCCG1 graphics mezzanine card can be deployed in the harsh environments of modern battlefields with typical uses including HMI (human/machine interface) applications such as mission computing and cockpit displays onboard military vehicles where high quality, artifact-free video is required. 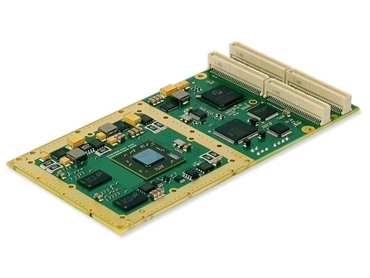 GE’s new graphics mezzanine card is available in five ruggedization levels from benign for development environments through to wide temperature (-40ºC to +85ºC) conduction-cooled. The PMCCG1 offers an optimum upgrade path for users of GE’s PMCGA4 graphics card, while also delivering a compelling option for new customers whose application requires the PMC form factor. According to Rod Rice, General Manager, Military & Aerospace Products at GE Intelligent Platforms, the PMCCG1 rugged PMC graphics mezzanine card continues GE’s tradition of developing COTS graphics solutions for a wide variety of land- and airborne platforms, and which have been successfully deployed in large numbers over the years. He adds that the PMC-based PMCCG1 provides an optimum combination of backwards compatibility and leading edge performance for customers using programs and applications that cannot use the XMC form factor for graphics. GE’s graphics card mezzanine solutions are being demonstrated at the FACE Exposition by Presagis, which specialises in COTS modelling, simulation and embedded graphics solutions to the aerospace and defence markets. Presagis recently announced SeaWind and SeaWind-178 OpenGL software driver support for the S3 2300E GPU. Nick Giannias, Vice President and Chief Technology Officer, Presagis explains that digital moving maps, 3D, video and sensor input lead the development in graphics applications in embedded computing solutions for the defence industry. He adds that Presagis Open GL SeaWind software drivers are engineered for safety as well as performance, and coupled with the S3 2300E GPU allow customers to fully exploit graphics technology in embedded applications.